Several years ago, NBC inaugurated the new age of the live TV musical. 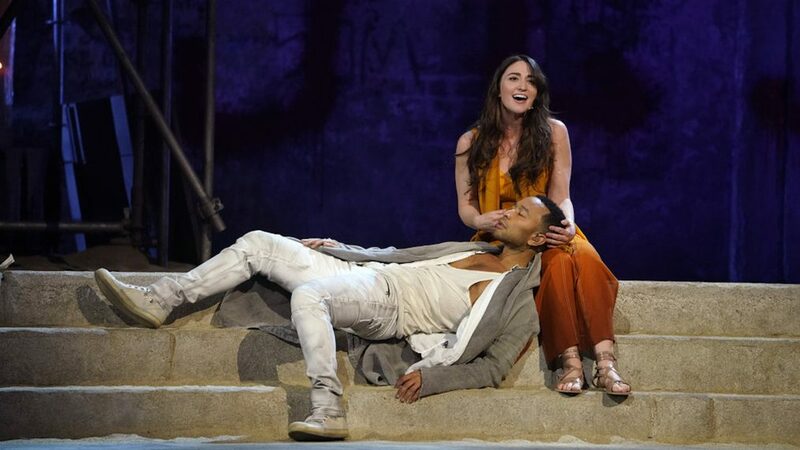 With Easter Sunday's dynamic presentation of Jesus Christ Superstar Live in Concert, the network elevated the form, setting a high bar for all that follow. Musically and technically, the Andrew Lloyd Webber-Tim Rice rock opera—think of it as Jerusalem Idol—soared from its overture to its transcendent finish, as the crucified Jesus of a soulful John Legend ascended into the heavenly rafters of Brooklyn's Marcy Armory. Sung through without the sort of awkward book scenes that can make musicals seem especially artificial on the small screen, Superstar is the most alive of any of these live events to date—because it felt like an authentic performance, with a rapturous audience roaring their appreciation during and after each spectacular number. Recent productions including Grease (Fox) and Hairspray (NBC) have edged toward playing to a live crowd in certain scenes, but after Superstar, producers are advised never to present another of these shows on an empty, hollow soundstage. The performers feed off the energy of an audience, and big surprise, theater plays best when done in a theater, even a vast stage like that of the Armory. John Legend as Jesus with the full cast of "Jesus Christ Superstar Live in Concert"
Sleek, spare staging on the handsome and cavernous set, with visible musicians on towering scaffolding, added a transparency to the near-constant swirl of movement and music, vibrantly directed by David Leveaux (with Alex Rudzinski as camera director) and choreographed by Camille A. Brown. The viewer rarely lost sight of the audience or the cameras, which only added to the sense of urgency, immediacy and excitement. The voices, the costumes, the set, the electric guitars! Legend led a strong cast of pop-rock stars and Broadway veterans. And while some high and very low notes may have been sacrificed for the sake of live television, this was for the most part powerfully sung and even acted. Sara Bareilles as a plaintive, sensuous Mary Magdalene and most notably Hamilton alum Brandon Victor Dixon as an anguished Judas were obvious standouts, as the text requires. I had hoped for a bit more showmanship from Alice Cooper's glitter-rock King Herod, but only Ben Daniels as Pilate seemed vocally out of his league. Kudos to a team of power producers including the musically inclined duo of Craig Zadan and Neil Meron, joined by Marc Platt of Broadway's Wicked fame. Their dedication to preserving this form of rarefied entertainment for the mass medium of TV is truly heaven sent, and may their next projects be as blessed.